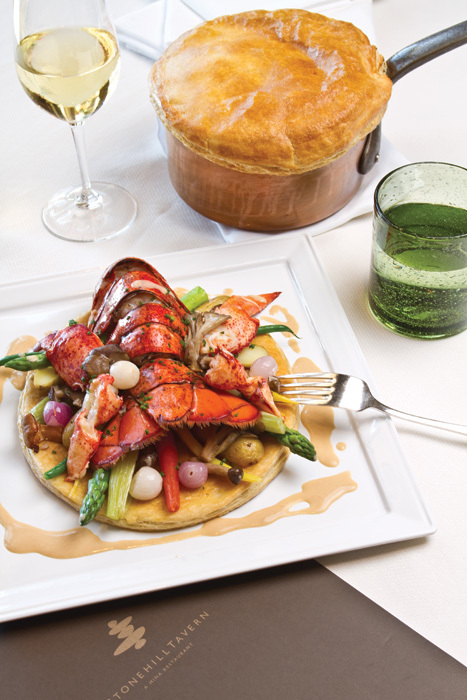 When St. Regis Monarch Beach announced Brian Black’s appointment as executive chef for the luxe Stonehill Tavern, I stifled a yawn. Not because Black isn’t a noteworthy talent. It’s just that this year, top chefs are bouncing around our coastal resorts like ice in a martini shaker. News of yet another barely registers a spike on this active dining seismograph. Black is one of five recent high-profile chef changes at South County’s poshest venues. But other than several just-added snacks and share plates, the menu is not remarkably different than it was under predecessor Adam Keough. Then again, this is a Michael Mina Group production and, as such, keeps Mina’s precise, considered vision front and center. It’s as if any Stonehill Tavern chef must put his ingenuity through the Mina filter. Early in Black’s tenure, dinner kicks off with a petite parfait of caviar, smoked trout, and chive crème fraîche. It’s an indulgent start, but virtually the same opening act that has played here for years. Dainty strawberries with supple burrata cheese are far more interesting. The perfect fruit hails from Harry’s Berries, the legendary Oxnard grower, but it’s the saba-vanilla sauce that makes the fragrant berries play so lushly off the mildly tangy cheese. Another night, we forgo Mina’s signature appetizer trios in favor of the night’s hummus three ways, an ideal share plate before the rich courses that follow. Duck prosciutto risotto is the night’s winning entrée, a special that stands out not only for its savory, comforting heft, but also for its newness amid entrées that haven’t changed much in the last year. Yes, the braised short rib is juicy and delectable, partnered with chunky glazed mirepoix, but it’s nothing new. Ruby-centered Colorado lamb is ultratender yet seems overpriced at $54 for a relatively basic preparation. Wines from the impressive list are half-price on Sunday, a deal that lures me back on that traditionally slow night at high-end restaurants. Indeed, the lustrous dining room is nearly vacant and the overcast sunset accentuates the emptiness. The menu is unexpectedly, but understandably, abbreviated. And though service is pointlessly formal and maddeningly slow, the food is superb. Steak tartare is mixed tableside into a glistening heap, with violet mustard and a quail egg. Tart green apples and crunchy crostini are fine support for the rich mixture. Lobster fritters are batter-fried nuggets of sweet meat and shiso leaf, speared with a stick for easy nibbling and dipping in crème fraîche. Fatty Tasmanian ocean trout dazzles with a relish of fat capers and golden halves of muscat grapes. Chunks of juicy Berkshire pig are delightful against smooth mascarpone polenta—mustard greens drenched in ham hock jus are the salty-bitter ballast that brings me back for more pork, though I am quite full. Yes, it’s pigging out—but in a ridiculously good way. Service is less fussy on a return visit to sample new items. Though these dishes are priced lower, they’re essentially deluxe bar noshes. A duo of petite, amazingly light pulled-pork sliders easily outclass the super-salty deviled egg trio. Hearty batter-fried fish are swell with their Cajun dipping sauce, but the fragile fresh chips taste only of salt. Dessert’s thrill is an exceptional molten chocolate cake that’s light in texture, with deep fruity, bittersweet notes. Paired with salted caramel ice cream, the dish flirts with perfection. Though it’s not on the menu, the kitchen keeps a few on hand, so ask if you want in on this secret. Black has helmed the stoves for several months now, but I still wish Stonehill’s menu offered more of his original work. Then again, he’s playing for Team Mina. So until there’s another shake-up—which seems destined somewhere along our coastal resort belt given the way chefs are shifting—I say enjoy Stonehill Tavern for Mina’s conceptual acumen, but be sure to order Black’s nightly specials. Pulled-pork sliders, berries and burrata, Berkshire pig, steak tartare, lobster fritters, molten chocolate cake with ice cream. Appetizers, $19 to $33; dinner, $24 to $65 and up for market-price specials. Booths flanking the bar for privacy; tables near windows for sunset views. On Sunday, wines are half off; daily 5 to 7 p.m. happy hour with discounted snacks, cocktails at the bar. Cocktails are unsung, but first-rate. Try the Moscow Mule, Ward Eight, or Lemongrass Rickey, if the spirit moves you.